Hi! I've been getting a lot of questions about how I learned to do Flash animation, so I've decided to write tutorials to share my knowledge about how to learn Flash animation on your own! These are mostly guides to help people find the resources to learn Flash, Actionscript (the coding syntax for Flash), and everything you need to know to get started creating your own fully-flash integrated site! This tutorial in particular is to get people familiar with what Flash actually is, and is key to understanding why Flash is such a powerful tool in any designer's pocket. Adobe Macromedia Flash - or just "Flash" for short - is a vector-based graphics and animation multiplatform that can be used to create images, movies, and websites. The great advantage that Flash has as a graphic medium and why it is such a popular online tool is that it is vector-based platform. As a vector-based multiplatform, Flash allows you to animate your graphics, retain high-quality images, and countless other things that you simply cannot do with other, more "traditional" graphics platforms. But what does this "vector-based" stuff mean? As many of might already know, most of the images that we see on the web and digitally are made up many many dots, called pixels, that blend together to create an image. These images, usually in .jpeg, .gif, .png, .bmp, &c file formats, are what we call "pixel-based" images or bitmap images, because - well - they're made of pixels! 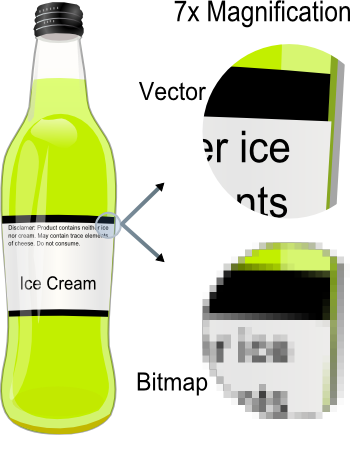 The thing about bitmap images and graphics, however, is that they contain very little information when it comes to doing other things besides "mapping pixels." You won't see many bitmap images moving around, and you will probably have horrible quality with certain formats and resolutions, especially zooming in and out of these graphics. However, with Flash, we can store a lot more information in the images and graphics that we create so that our graphics can do much more than just be static, single-resolution images. Unlike regular, pixel-based bitmap images that you usually see on the web, graphics made in Flash (known as Flash objects) usually with a .swf (short for ShockWave Flash) file extension are what we call vector-based objects. In other words, objects in Flash are not made up pixels, per se, but vectors that contain the information to produce pixels and tell them how to be arranged, resulting in a vast number of capabilities that are superior in many ways to the pixel-based bitmap images that we are used to. But what are some of these capabilities? For example, consider image quality. When you zoom in on a pixel-based images, like a JPEG or a Bitmap image, you'll find that your computer will simply make the pixels that make up your pixel-based images bigger, resulting in a massive loss of quality with each zoom. This is because most pixel-based images do not have the information encoded into them to retain the quality you might get when an image is at a regular size, so when you do zoom into an image that is pixel-based, your computer does the next best thing, which is to crudely make the pixels that make up the image larger. With Flash objects, however, you won't see this happening. You will never lose quality with objects that are made with Flash because the information that is encoded into them are the base "formulas" that will produce the pixels and arrange them in the first place. So when you zoom into an object that is created with Flash, you will never lose the image quality that you started with. However, Flash takes an obvious step above from creating simple images that are static. There are, of course, many advantages to having infinite resolution for your images in Flash, but this isn't what most people think of when they want to learn how to use it. Most people think of something else entirely different: movement and interactivity. With Flash, all this changes. You can do an infinite number of things with images and objects made in Flash that allow you to change the actual form of your images, allow them interact with users, send information to and from servers, send e-mails, create movies, and countless other things! With Flash, the possibilities are endless as a file format that works independently on its own and combines all the information in one bundle, without much need for supplemental programming for basic functionality. However, there is a catch: Actionscript.